The spring semester is rapidly settling in! We are anticipating nine classes in the SAL across disciplines – Archeology, Art, Art History, Environmental Science & Policy, Geosciences, Latin American & Latino/a Studies, and Sociology. 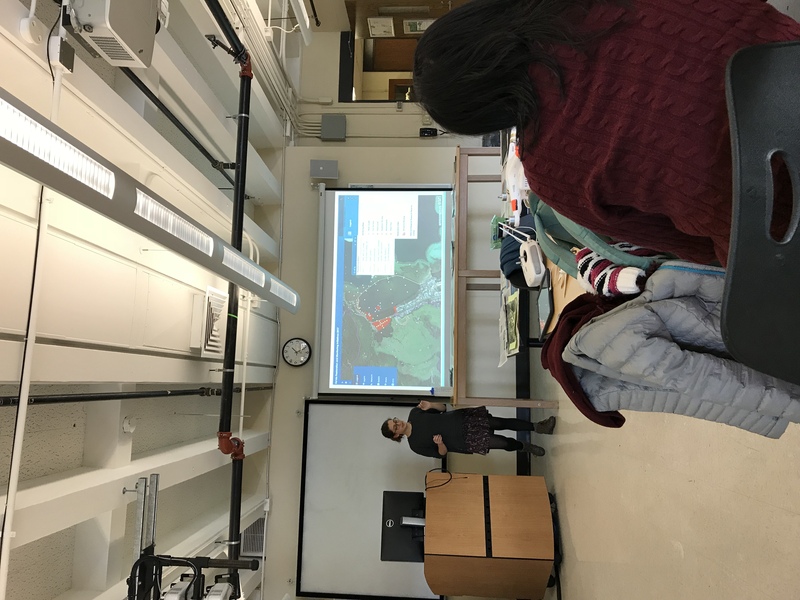 Smith College’s fundamental GIS course, Modeling Our World: Introduction to GIS (GEO/ENV 150), had another successful semester under Jack Loveless. 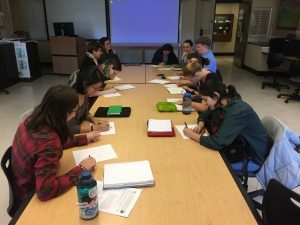 Students accumulated considerable skills throughout the semester that culminated in final projects with campus sustainability departments and local conservation non-profits. Examples of topics include tracing Smith dining produce flow, invasive species management by the Botanic Gardens, and Massachusetts Department of Conservation and Recreation trail signs. Students in Laura Fugikawa’s Queering Displacement: Race, Sexuality and Space (SWG 324) scrutinized the relationships of space and power in mapping and counter-mapping, and were introduced to story maps as a compelling digital storytelling platform to convey their final projects, such as visualizing reproductive healthcare desserts in Native American communities and tracing non-conforming family lineages. Students in Laura’s Queering Displacement course started the class with hand-drawn maps of the campus and their respective hometowns. Aspiring engineers in Drew Guswa’s Ecohydrology Seminar (EGR 315) went global and investigated spatial and temporal characteristics of precipitation data in the Monteverde watershed, Costa Rica using interpolation techniques. Closer to home, they used GIS to scout potential conservation sites in the Mill River watershed that could optimize the viability of Paradise Pond. Susan Sayre’s Interpreting and Communicating Information (ENV 311) course coupled their insights from visualizing traditional statistics with new-found appreciation for cartography, data representation, symbology, and classification schemes. Students supported disparate arguments with maps on Toxic Release Inventory (TRI) sites in Massachusetts, and the opioid epidemic in Massachusetts. 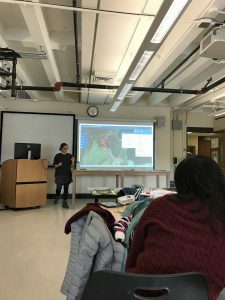 In Researching Environmental Problems (ENV 201/202) class, taught by Denise Lello, students dipped their feet in navigating ArcMap and analyzed environmental justice data to answer questions regarding accessibility for vulnerable communities in Texas post Hurricane Harvey. We offered the fundamental skill-building workshops such as Communicating Data with Maps, Web Mapping in ArcGIS Online, and Making Story Maps, which leveraged desktop and increasingly popular web-based GIS. There were two new workshops Fiction and Fantasy Maps, and Can I Map That? that curate to expressed interests in learning how to acquire spatial data and unconventional uses of GIS. Jon introduced spatial perspectives of viewing our world in Reid Bertone-Johnson’s Introduction to Landscape Studies (LSS 105) class. Jon, along with Kate Lee, also engaged with classes (such as Bernadine Mellis’ Advanced Production Workshop (FMS 282)) and departments discussing the pivotal roles drones play at Smith. Finally, we co-presented “Map Battles: The Pen versus The Mouse: Outlining the Intersection of Mental Mapping and GIS” with Jamie Worms from Latin American & Latino/a Studies on the seemingly disparate approaches to conventional mapping (with pen and paper) versus using associated GIS technologies. The fall marked a smooth transition into the Libraries, which highlights the multifaceted application of GIS and spatial analysis on campus. We piloted a drone study group to facilitate a forum for faculty and students interested in utilizing drones in research and having in-depth discussion of regulations and ethics in using drones. We received President McCartney’s Innovation Grant on Inclusion, Diversity, and Equity with our proposal “Mapping Identity in Unbalanced Landscapes.” Our project hope to address identity-making in a formative campus that is responsive to spatial design. On GIS Day, Rachel Moskowitz, one of our SAL assistants, shared her summer NOAA internship experience using GIS to coordinate wetland restoration in He’eia, Hawaii.